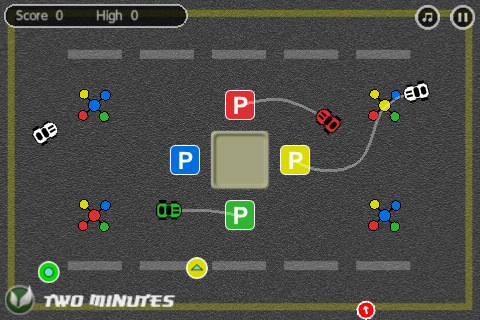 Line Ninja is a compilation of different maps of different variations of the line-drawing gameplay genre. Dock ships in the Asteroid Zone, manage ships, planes, and cars on the Beach, guide chickens past tractors into their coops, help doodles escape from pencils, or balance out the ying and yang forces of good and evil!! It’s just that epic!!! But is it good? Created by Steve Perks, Line Ninja is available on the iPhone, iPod touch, and iPad for $0.99. This is a multitasking game. Each different map has a completely different gameplay style all based on the same engine of dragging a path for a sprite to run on while avoiding collisions and collecting the odd powerup here and there. Asteroid Zone has you guiding a very familiar ship around very familiar asteroids and trying to hit the middle to ‘dock’ your ships. Beware of the random UFO and you’ll be fine. Beach Adventure is a multi-vehicle guiding game where you prevent them from hitting each other as you try to park cars and hovercrafts, dock ships, and land helicopters. 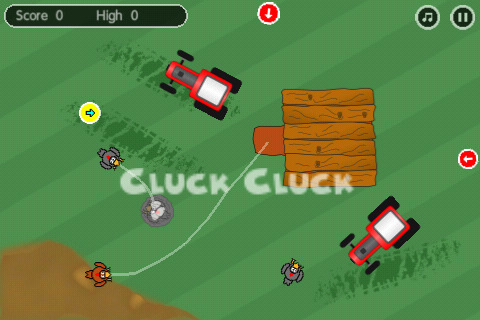 For Chicken Dance, you guide chickens safely around giant tractors into their nests or coops. Doodle Escape tasks you with delivering stars into their proper paper rips depending on their color while avoiding evil pencils. Finally you have Emoticon 12, where you have 6 good faces and 6 bad ones. You guide them into their proper areas of the ying yang symbol. I have to say that the art is extremely basic. Nothing truly stands out with the exception of the Asteroid Zone, but the only thing that stood out to me in that one was whether they asked for permission to do that or if the Asteroid look was available for anyone to use now. The sound effects are cute at times, and they are making new maps, so maybe over time, the graphics will get better and better. This app plays fine, has some frantic moments, but for a short period of time, it’s entertaining and good for a couple minutes on the bus. In the end, isn’t that what we should expect? I wasn’t too impressed, but I was very entertained. AppSafari review of Line Ninja was written by Joseph Ho on October 21st, 2010 and categorized under App Store, Games, Line Drawing. Page viewed 3505 times, 1 so far today. Need help on using these apps? Please read the Help Page.